A neuroma is a benign (noncancerous) growth of nerve tissue that can develop in various parts of your body. 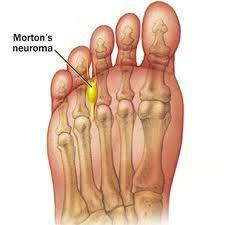 One common type is called ‘Morton’s Neuroma’ or plantar neuroma. It occurs in a nerve in your foot, often between your third and fourth toes. It is a thickening of the tissue around one of the digital nerves leading to your toes, and can cause a sharp, burning pain in the ball of your foot. Your toes also may sting, burn or feel numb. Morton’s neuroma may occur in response to irritation, injury or pressure — such as from wearing tight-fitting shoes. However, it can occur for unknown reasons. At first, the pain may worsen when you wear tight or narrow shoes or engage in activities that place pressure on your foot. Over time, though, symptoms may last for weeks or months. Treatments for Morton’s neuroma commonly involve changing footwear, resting your foot, and using arch supports or pads to help take pressure off the area. In some cases, your doctor may recommend anti-inflammatory drugs, a cortisone injection or surgery.